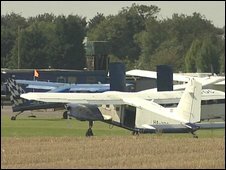 A skydiver has plunged to his death at an airfield in North Lincolnshire where another parachutist died six years ago. The 44-year-old man from Essex is believed to have been taking part in a group skydiving event at Hibaldstow Airfield on Saturday afternoon. Humberside Police said they were investigating the death, but it was not being treated as suspicious. Stephen Hilder, 20, died at the same airfield in 2003 after his parachutes were sabotaged during a competition. Humberside Police launched a murder investigation before concluding that he had probably cut the straps himself. An open verdict was recorded at his inquest. A force spokesman said Saturday's incident was not being treated as suspicious "at this time". "However, we are still keen to speak to any further witnesses who have yet to come forward," he said. "Inquiries are continuing into the circumstances of the incident and a file is being prepared for the coroner's office." Police would particularly like to speak to anyone who witnessed the jump or who may have seen the man pack his parachute before his jump. He said the man who died may have been taking part in or preparing for a formation skydiving event at the airfield involving about 60 jumpers from across the UK.